Join me for the first of a three-part Moroccan retreat series with Sunny Side Up Travel. Please note that timings are a rough estimate and will depend on the group, the weather and the swell! We are travelling to the south-Atlantic coast for the first of three trips in this series. Approximately 15km from Agadir, The Yogi Surfer, will be our home for four days. 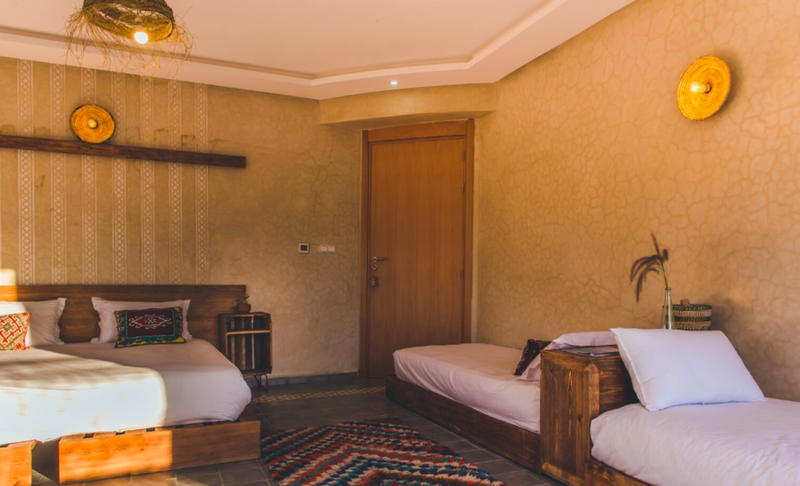 Located on the peak of a small hill in the iconic bay of Taghazout, this boutique hotel has stunning views of the ocean and offers you a warm welcome and true Moroccan hospitality. We will be serving clean, organic, nutritious food. The Yogi Surfer prides themselves on sustainability, so they work with local chefs to prepare delicious meals with fresh, seasonal produce. We can accommodate a full range of dietary options including vegetarian, vegan and gluten free. You can let us know more about what you need when you book. Expect abundant fruits and salads, freshly caught fish from the region, traditional couscous and tagines, and copious amounts of Fresh Moroccan mint tea. All levels are welcome, but I do recommend coming to one of my classes before the retreat, if possible. I aim to create a welcoming space for students - new and experienced - to find grounding and adventure on their mats. My sequences are challenging yet attainable, and I try and encourage students to achieve their goals in a safe and supportive learning environment. Adjustments will be offered for injuries and variations for the more experienced practitioner. Everyone should expect to come away learning something new. Transfers from Agadir to Taghazout can be arranged, but are not included. ** A £350 deposit is required to hold your space. Once received you will be sent booking + waiver forms as well as details for payment plans should you wish to be put on one.